Right now it's a scorcher of a day - one where you wish your whole house was an igloo just so you could escape the inescapable heat in icy cool shade. Two new escapees to It's A Dan's World are Admira Wijaya and Adam David Dodd - let's hope they brought a cool drink! Admira Wijaya has already been featured on IADW. His stunning artwork graced Sundays Making a Mark segment a few weeks back. I was appreciative of the fact he left a comment on the post, but to have him click 'follow' as well is just all kinds of cool! Speaking of cool, Adam David Dodd is also a fan of Psylocke Like A Butterfly! The IADW crew already know about 'My Thing For Psylocke', so any fan of hers is always welcome in these here parts! 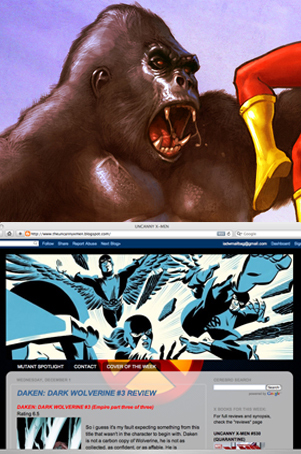 Plus he runs his own x-fan site theuncannyxmen blog! Welcome to IADW Admira and Adam - glad to have you aboard! thanks, but it's ADAM dodd, unless there is another one on your site with the same last name who is also a follower on the Psylocke site, and who also is named the same as my father. it could happen, either way, hi. also, www.theuncannyxmen.blogspot.com is my site, i'd like to see you there! Sorry Adam, no offence meant. With your profile on private I wasn't able to see if you ran a blog or not, only a handful of the ones you follow. All sorted now though - thanks for letting me know - it looks great! and i'll check out the profile it should not be on private, i'll fix it. Great site you have there Adam. The X-titles were my focus back in the day so your blog is a perfect way for some of us to catch up with the storylines. Thanks Adam - glad you like what you found here, and I agree with Craig, as a guy who can't afford to keep up with the X-gang, your site will help keep in touch with the old fav's! plus, Dan's not the only member of the Psylocke fan-boy club here.